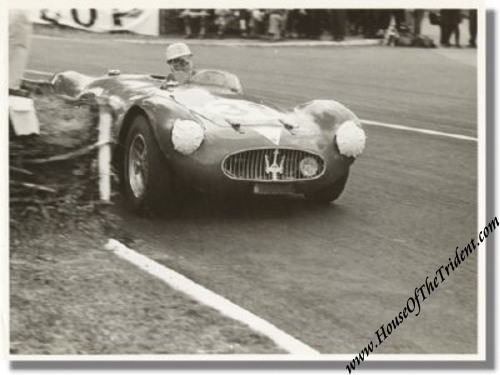 This is a vintage 1955 photo of the works entered # 31 Maserati A6GCS of Giardini and Tomasi during the 1955 running of the 24 Hours of Le Mans. The factory-entered car with chassis-number 2082 retired from the race in lap 96 due to ignition problems. 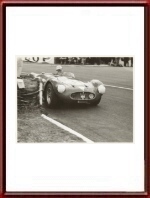 After this race the car was sold to Venezuela and re-imported into Italy in the early 1990's. It has since then competed successfully at the Retro Mille Miglia for several years. Size: Approximately 22 x 16 cm or some 9 x 6 inches. It carries the stamp of Geoffrey Goddard on the back.